I absolutely love this recipe! It is by for the best beef stew I’ve ever had. One thing I would have to recommend when you make it though. Use watered down beef broth instead of just water. It gives the stew so much more flavor, and it comes out a little thicker. Also, if you don’t have a pot that can go into the oven, like me, then for the hour and a half the stew is suppose to be in the oven, I just covered and kept it on the stove on low to medium-low. Just make sure to keep it covered and that you don’t make it boil. You want it to be steaming and maybe a view bubbles, but not boiling. And I cut my veggies just a little smaller then they recommend in the recipe, cause they seemed a little big. Other then that, this recipe is to die for! 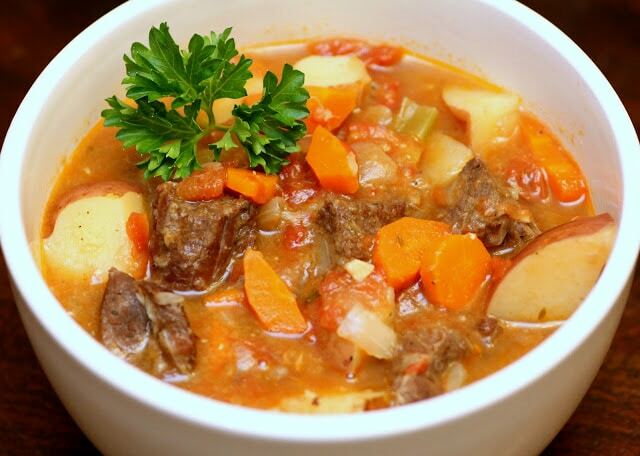 It takes a little while to make so plan ahead, but if you are a stew person you will love this. Enjoy! Heat a large Dutch oven with a tight-fitting lid over medium-high heat. Pour in enough oil to fill the pan about 1/4-inch deep. Spread flour out on a plate or piece of wax paper. Season half the beef generously with salt and pepper, then dredge in the flour. Shake off the excess flour, and add to the pan. Saute the meat, uncovered, stirring only occasionally, until well-browned, about 8 minutes. Using a slotted spoon, transfer the beef to a plate. Repeat with the remaining beef. Discard the oil and wipe out the pan. Preheat the oven to 275 degrees. Return the pot to the stove and melt the butter over medium high heat. 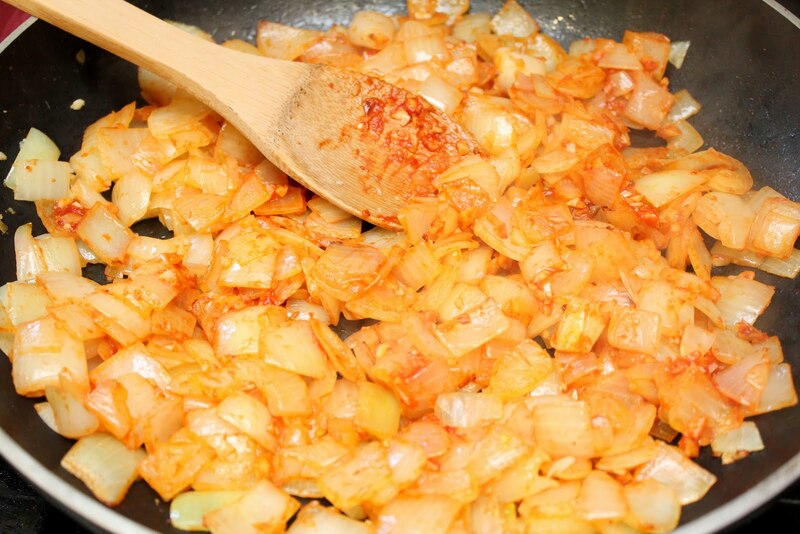 Add the onion and cook, stirring, until lightly browned, about 5 minutes. Add the garlic and cook, stirring, until fragrant, about 1 minute. Add the tomato paste and cook, stirring, until lightly browned, about 1 minute more. Return the beef to the pot and add the water or broth, and bring to a simmer. Using a piece of kitchen twine, tie together the parsley, thyme, and bay leaves and add the bundle to the pot. Season with 2 teaspoons salt and pepper to taste. Cover and transfer to the oven. Stew the meat until tender, about 1 1/2 hours. Remove the dutch oven from the oven. Skim the fat from the cooking liquid with a ladle. Add the potatoes, carrots, celery, and the tomatoes, and bring to a simmer. Stew, uncovered, on top of the stove, stirring occasionally, until the liquid has thickened and the beef and vegetables are tender, about 1 hour. Remove and discard the herb bundle. Stir in the vinegar and season with salt and pepper to taste. Divide among bowls and serve immediately. 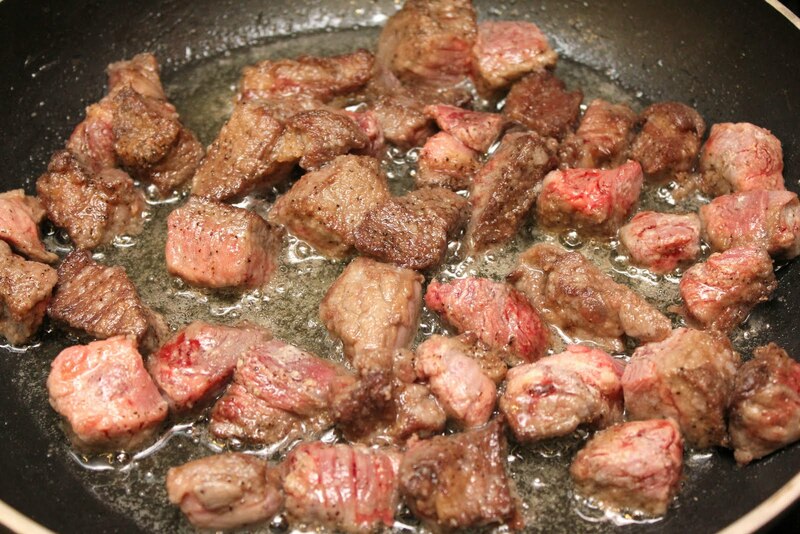 Cook’s Note: Beef chuck, because of it’s marbling of intra-muscular fat, it’s the choice fur any type of stew. If you can’t find chuck cubed for stew in your meat department, buy a thick steak and cute it into 2-inch cubes.